Over the last week and a half, the strangest thing has been happening. England are in a competitive football competition, and our press are behaving for a change. But today, they broke ranks, and we have loads of nonsense about “Rooney the Saviour”. Lets not forget the only reason he has been out for two games is the fact that he let is petulant behaviour take over on the pitch, a bit like his fellow scouser, one Mr Barton (incidentally, one of the greatest and worst twitter users in history). I have started this article prior to the Ukraine game, and will publish afterwards. So first up was the big game, and the old rivalry was renewed with our mates from just past dover, the French. This game was a good test of new manager Roy’s skills, and to be fair he came out well. Nice and compact, not to adventurous, and a defender comes up to nod one in. Then old England raised it head, and the panic set in. Within a few minutes it was one all, and we then shut up shop. I’ll take a point in our first game (Spain did !). Onto the next game, and a battle with a team who we had never beaten in a competitive game, Sweden. I watched the Swedes earlier in the year at Wembley, and they weren’t all that. 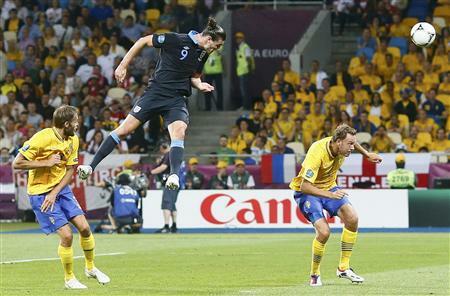 Once again England went ahead, after a towering header from Andy Carroll, and this time they held firm. The second half was just crazy, with neither team really having a record for attacking football, turning into a mid 90’s Man United (evening Col !). They both got two, and the game ended 3-2 for Roy. I say Roy as he made the sub to change it all, the forgotten boy of the last world cup squad, one Theo Walcott. He was on for about 4 mins when he equalised from 25 yards, he then proceded to cut Sweden apart, and provided the run through and cross for Danny Wellbeck’s winner. Now what happens? We need a draw to go through, and apparently Rooney has to start? I sugget Young gets dropped as he was useless in the last game. I would keep Milner on for this game ,as Ukraine like to attack the flanks. Walcott needs to come on in the second half as a sub, and we will win 2-0 (Wellbeck, Rooney). What really happened was the following: Ashley Young was given a stay of execution and the only change was Carroll out for Rooney. England started quietly and remained that way for most of the first half. 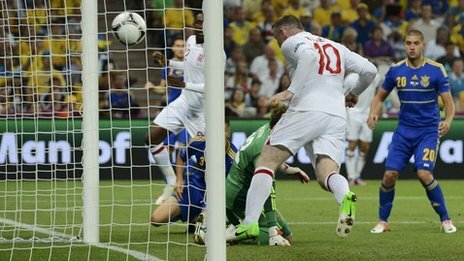 Ukraine had the best chances, but Rooney missed a sitter to go one up. England started the second half organised as well, and Gerrard was magnificent with a range of passing not seen since his heyday. Then after a deflected cross from Gerrard, who springs up? Mr Rooney, back post, one nil. Then the retribution for Germany in the World Cup. Ukraine had a ball clearly over the line that the linesman, who was about 5 yards away, missed !! Laughable. Thanks for the extra officials, Sepp and Michel ! Drama over, England hold on to one nil ,and set up a meeting with Italy in the Quarters. One thing i did notice was that Roy seems to have drilled the centre backs to drop in behind Hart if there is a remote issue, and this definitely saved us once, and maybe more with some half chances in the first half for the Ukrainians. Ashley Young really needs to be dropped, if we are to improve. JT needs to drop a yard, as his lack of pace is being exploited. We will need to be more expansive against Italy, but they won’t exactly be charging us down either. Another one nil will do me !